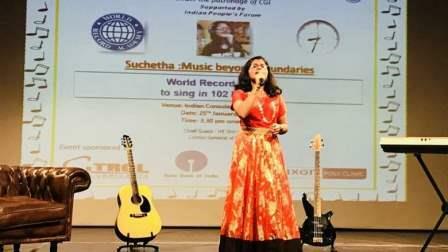 It was the perfect gift twelve-year-old Suchetha Satish could give her country on the eve of the Indian Republic Day by breaking the world record of singing in over 100 languages at a concert held at the Indian Consulate Auditorium, Dubai on Thursday evening. Twelve year old Indian High School student Suchetha Satish left the audience spellbound as she took to the stage fluently singing song after song in different languages and made the transition look super smooth. She began singing at 4.10pm and tirelessly finished her non-stop singing marathon by 10.30pm. The grade seven student sang for over six hours and covered almost all European languages, 26 Indian languages, several other South American languages and South East Asian languages. "She just picks the song she likes and then checks the lyrics and understands the meaning of it through Google translate. Although she doesn't know the languages but the particular song she picks, she ensures she has the perfect diction and tune," her father T.C Satish said. In the concert that lasted for six hours and 15 minutes, the child prodigy sang song after song in 102 languages, stunning the audience including Indian diplomats, her friends, teachers and well-wishers, including singers and doctors. Congratulating Sucheta on her achievement, Consul General of India in Dubai Vipul, said: "It is indeed an incredible feat and it is a great gift from her to us on the eve of the Indian Republic Day. I am happy that she used the consulate auditorium to achieve this feat. Social worker and the event coordinator Girish Pant said : " This is a proud moment for both India and the UAE. We feel honoured that on this momentous occasion of our Republic Day, young Sucheta has given us an opportunity to walk with our heads held high." Talking about how Sucheta started getting interested in singing in different languages, her father told Khaleej Times: " It all began just a couple of years back when a Japanese friend of mine visited home and sang a Japanese song that my daughter found very appealing. Suchetha at once learnt the song and recorded and sent it back to my Japanese friend next morning. The song was sung in perfect tune and pronunciation and my friend then posted it on FB. It got lot of encouraging comments from Japanese people saying the song was sung with the perfectly. This is how it started and after that there was no looking back. She started loving singing in different languages and it became a passion. Sometimes she learns a song in as less as two hours. I send these songs sung by her in different languages to my friends of different nationalities and get their feedback on them regarding Suchetha's diction, pronunciation of the language," her father said. The last set of 14 songs were her favourite set of songs. She ended with a Hindi number and her second last song was also sung in Arabic. "Although she loves Armenian and Slovak songs in particular, she also loves Arabic and Turkish songs," said her father added. Giving out a message to the youngsters of the UAE, the star performer said: " Children should pursue their passion. I am also actively campaigning against tobacco, alcohol and drugs and I feel youngsters should use music and sports as medium to spread the awareness. Sucheta also visits labour accommodations during events and even take a pledge from from many workers to quit these bad habits.